Flow cytometric analysis of Hela cells using HSP90 (C45G5) Rabbit mAb (PE Conjugate) (solid line) compared to concentration-matched Rabbit (DA1E) mAb IgG XP® Isotype Control (PE Conjugate) #5742 (dashed line). 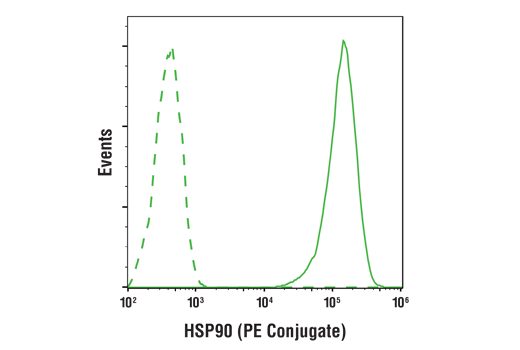 HSP90 (C45G5) Rabbit mAb (PE Conjugate) detects endogenous levels of total HSP90 protein. This antibody does not cross-react with other HSPs. Monoclonal antibody is produced by immunizing animals with a synthetic peptide surrounding Asn300 of human HSP90. This Cell Signaling Technology antibody is conjugated to phycoerythrin (PE) and tested in-house for direct flow cytometry analysis in human cells. This antibody is expected to exhibit the same species cross-reactivity as the unconjugated HSP90 (C45G5) Rabbit mAb #4877. HSP70 and HSP90 are molecular chaperones expressed constitutively under normal conditions to maintain protein homeostasis and are induced upon environmental stress (1). Both HSP70 and HSP90 are able to interact with unfolded proteins to prevent irreversible aggregation and catalyze the refolding of their substrates in an ATP- and co-chaperone-dependent manner (1). HSP70 has a broad range of substrates including newly synthesized and denatured proteins, while HSP90 tends to have a more limited subset of substrates, most of which are signaling molecules. HSP70 and HSP90 often function collaboratively in a multi-chaperone system, which requires a minimal set of co-chaperones: HSP40, Hop, and p23 (2,3). The co-chaperones either regulate the intrinsic ATPase activity of the chaperones or recruit chaperones to specific substrates or subcellular compartments (1,4). When the ubiquitin ligase CHIP associates with the HSP70/HSP90 complex as a cofactor, the unfolded substrates are subjected to degradation by the proteasome (4). The biological functions of HSP70/HSP90 extend beyond their chaperone activity. They are essential for the maturation and inactivation of nuclear hormones and other signaling molecules (1,3). They also play a role in vesicle formation and protein trafficking (2). Nollen, E.A. and Morimoto, R.I. (2002) J Cell Sci 115, 2809-16. Young, J.C. et al. (2003) Trends Biochem Sci 28, 541-7. Pratt, W.B. and Toft, D.O. (2003) Exp. Biol. Med. 228, 111-133. Hohfeld, J. et al. (2001) EMBO Rep. 2, 885-890.